Make sure that you and your employees are prepared to stop illegal firearm purchases. Bring the Don't Lie for the Other Guy message into your store. 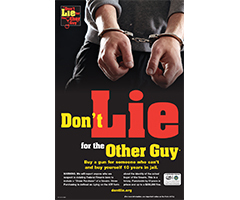 The Don't Lie Retailer Kit includes display items to warn the public about the severe penalties for engaging in straw purchases and educational information to help retailers recognize and stop any would-be straw purchaser.